Ryanair is facing two more days of strike action by some pilots based in Ireland. A pilots union announced that the 24-hour strikes will take place on Friday 20 July and Tuesday 24 July. 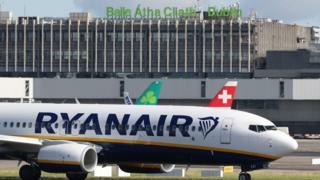 The news comes after the airline faced its first day of industrial action in Ireland since it bowed to pressure from staff and recognised trade unions. Ryanair cancelled 30 flights between Ireland and the UK because of Thursday's 24-hour strike. A quarter of Ryanair's Irish-based pilots launched the strike over their pay and conditions. Their concerns include a dispute over seniority, as well as the procedures for allocation of base transfers, promotions and annual leave. The airline has apologised for the "regrettable disruptions" and said it was trying to minimise the strike's impact on people travelling to Portugal, France, Spain, Italy and Greece. On Thursday, the Irish Airline Pilots' Association announced the additional two days of strike action. It said in a statement that while some common ground had been found in Wednesday's talks, there was a failure to reach agreement on the terms of reference for a working group to look at the pilots' issues. Ryanair's chief people officer Eddie Wilson described Wednesday's talks as constructive but very frustrating, according to Irish national broadcaster RTÉ. He said the airline remained available to resume talks. Last autumn, Ryanair was forced to cancel hundreds of flights after rostering failures left the airline with insufficient crew. At the time staff made it clear they were unhappy about their working conditions. Despite a history of hostility towards unions, the airline eventually agreed to recognise them in December. This year the airline has suffered some minor industrial action in Germany and Portugal, but unions are gearing up for a series of strikes that could affect routes across the continent. Cabin crew in Italy will strike for 24 hours on 25 July, while cabin crew in Spain, Portugal and Belgium will strike for 48 hours on 25-26 July. One of their requests is that they be paid into bank accounts in their own countries, rather than in the Republic of Ireland.